Wrapped in a thick blanket, its familiar scent imparting added security, little hands shelter wide eyes from the flickering screen. Peeping through the small cracks between fingers, a sigh of relief is issued when it’s revealed that the shadowy figure rising from the moonlit pumpkin patch is only Snoopy. But the tiny viewer’s heart continues to beat quickly, not out of a sense of fear but rather that of victory; the horror at hand having been confronted and overcome. And the memory of that feeling remains, a triumphant bit of nostalgia that one can carry into adulthood. 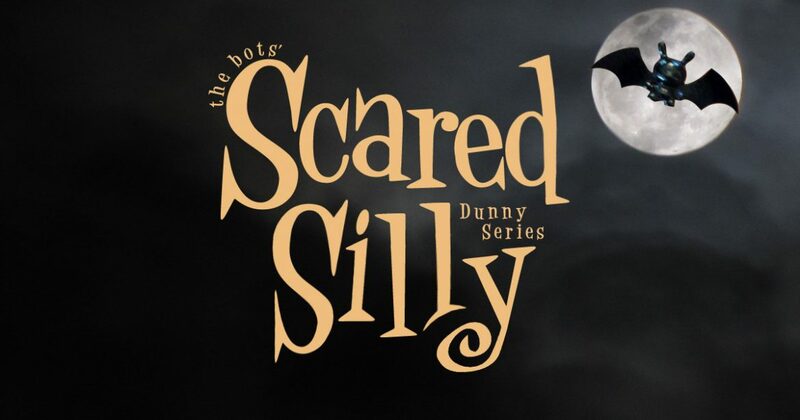 For that is the power of a good thrill, a piece of frightful fun for all ages, which is exactly what has been harvested and bottled up to create the Scared Silly Dunny Series. And masterminding our controlled descent in adorable darkness are the husband-and-wife team of Jenn & Tony Bot, a duo also referred to as The Bots, but who are they and by what pedigree do they bring their delightful monstrosities to Kidrobot? Hailing from Fort Thomas, Kentucky, The Bots’ work is “often characterized”, as they freely admit, “by its vibrant colors, original characters, and the grumpiest of monsters”. Perhaps best known for their handmade original pieces, which frequently employ Kidrobot’s rabbit-eared Dunny form as a base, they fear that “it is easy to label our art based on its texture, weight, and even medium”, as their signature style decorates the sculpture with “nothing but hand mixed polymer clay”, but they prefer to emphasize their “work as character driven. We set out to be storytellers”, they explain, “to express a feeling or mood through our pieces that often reflect our lives during the time of its creation”. Since their art toy beginnings in 2010 through to today, which by their count is over 500 unique works later, “we approach every piece’s story first”, they admit, adding that if the story “doesn’t make sense or have a quality that brings the piece to life, [then] it simply won’t get made.” And while handmade works like those pictured above “will always be our bread and butter”, the duo state, “we thoroughly enjoy making production figures, because not only do they reach a much vaster audience but simply because we get the satisfaction of owning them too”. While The Bots have enjoyed several of their designs becoming factory produced pieces over the years, the above-pictured trio were their first along these lines with Kidrobot, released as part of the Designer Toy Awards Dunny Mini Series earlier this year. “Designing for the DTA series was a pretty big challenge”, they admit, as the “lack of a theme for the series, while extremely freeing, ultimately proved to be a pretty big hurdle”, one that resulted in “a massive explosion of new work: 20 designs in 2 weeks. And then just that fast we tossed out all 20 designs, went back to the drawing board, and started to focus on the idea of what had been and hadn’t been successful for us in the past”. As such, “we reviewed our most popular designs, chose three that we and our collectors loved, and submitted accordingly”, The Bots state, adding that they are “extremely happy with the end result and feel that all three pieces represented our portfolio well”. But this wasn’t the duo’s first partnership with Kidrobot. “One could assume we had been on Kidrobot’s radar for some time”, the duo ponder aloud, and while “we have never had a chance to meet any of the team in person, we were put into contact with Frank shortly after he took over as creative director and immediately started submitting designs”, which ultimately led to their first publicly displayed collaboration with the brand, The Amazing Alumit handmade series. Click Here to Find the Nearest Kidrobot Retailer Near You.